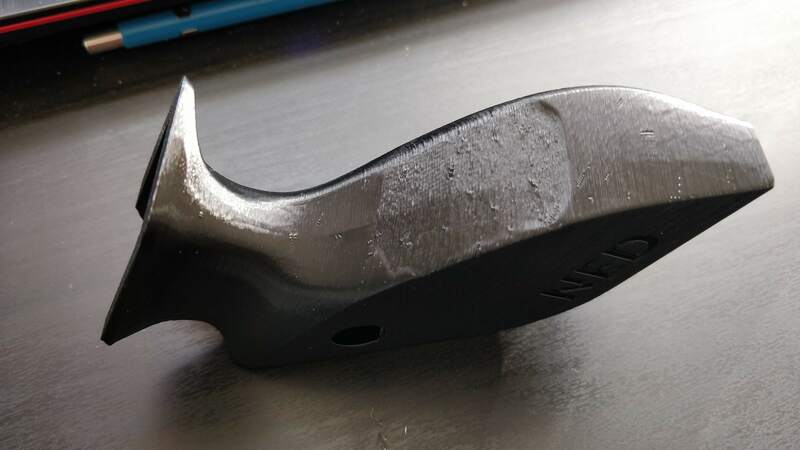 Hi everyone I have a problem when I print black print I always get a part of the print dat has a very bad surface could this be just the brand of the filament? its just PLA! someone an idea what to do about it? I sometimes have problems with overhangs of a certain angle. I’ve only recently noticed it, and been trying to characterize and prevent the problem. Guessing from the way the layers are going, it looks like the poor print section could be an overhang. I first noticed that while the overhang is growing, the edge will be flimsy, and flex some as the print head moves over it. It only happens at certain angles and sizes though, usually the smaller, steeper ones, with a low infill. I theorize that the actual print area is small enough that it doesn’t have time to cool off before the next layer is deposited. It also seems to slightly affect the side closer to the fan more, but I have observed the issue on all sides of the print. I really noticed it when I was printing spheres for a science class project. I have been testing this theory by blowing on the section during and after the print head moves over it. So far, the results are better, but still not great. One of these days, I want to mount a spare CPU fan on the end of the axis that holds the print head, blowing back over the print surface. Maybe even both ends. This doesn’t explain why it would affect black PLA more than another color though, so this may not be your problem. Are you using Snapmaker PLA, or a different brand?